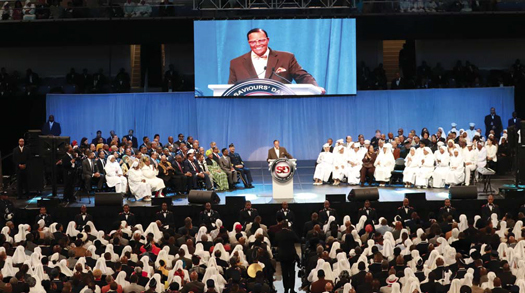 The Honorable Minister Louis Farrakhan delivered a powerful and deliberate message of warning and guidance in front of thousands at Wintrust Arena at the conclusion of the Nation of Islam’s 2018 Saviours’ Day Convention which drew a diverse array of participants and attendees from around the world. CHICAGO—“The Honorable Minister Louis Farrakhan is like a father to me—Pops. And I really want the world to know that. It’s important that we shouldn’t have any fear to be around his talking, because it’s the truth and to be a young girl to have been around him and to sit at the feet of greatness my entire life, was important to me for people to know that,” said Stephanie Mills, Grammy-award winning recording artist. Ms. Mills made these comments after Min. 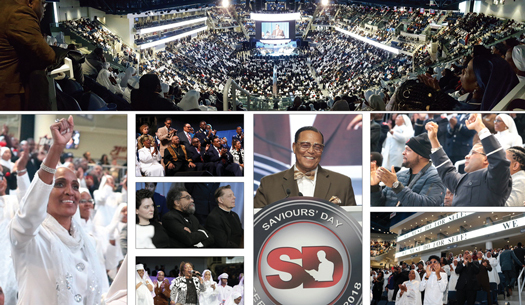 Farrakhan’s nearly three-hour address concluding the Nation of Islam’s annual Saviours’ Day Convention. The message was met with positivity and excitement by many but stinging and repugnant rebuke from critics who nearly two weeks after his speech are still rehashing and clinging to 30 year old, tired arguments accusing the Muslim leader of anti-Semitism, homophobia, misogyny and even for provoking violence. Black activists and politicians have come under Jewish-led unrelenting pressure and demands to condemn and rebuke Min. Farrakhan for being present at the event, holding a conversation with him or even being in the same room or vicinity as him. There were no media reports that any of the nearly 11,000 men, women and children who filled the Chicago Wintrust Arena during the Feb. 25 address rushed out in a frenzied, crazed, hate-filled rage and panic into the streets and began violently attacking members of the Jewish, LBGTQ or White communities after listening to Min. Farrakhan’s message. There has been no reported organized boycott or protest of synagogues by the thousands of attendees. Though the audience was made up of mostly Blacks, it was a racially, ethnically and religiously diverse audience. Min. Farrakhan’s message was also broadcast worldwide via the internet. According to Jesse Muhammad, social media strategist for Min. Farrakhan and the Nation of Islam, as of March 5 on Twitter, YouTube, Facebook and Instagram there were over three million combined views of the full message and clips. For critics that argue the soon to be 85-year-old leader’s message spurred intolerance and hate, for Chicago State Sophomore Javontay Logan who was there in person for the message, it relayed something markedly different. Lola Anderson an administrative assistant with Chicago Public Schools told The Final Call that she loves it when the Muslims come to Chicago and she gets to hear from Min. Farrakhan. “I was very impressed with the words of Stephanie Mills about the Minister. She’s known him since she was 16. She knows him in a way that most of us don’t and she’s not a Muslim. That says a lot. She seemed to be very sincere and moved by her relationship with the Minister. I was very happy with what I saw. I love Minister Farrakhan,” said Ms. Anderson. “Farrakhan is a good man, who leads his followers along a path toward self-improvement, not into a life of hate, intimidation and violence, as do the Trump-inspired race-haters, now called the ‘alt-right,’” wrote Askia Muhammad, who is also senior editor for The Final Call. The long-time journalist took the now widely-circulated 2005 photograph of then-Senator Barack Obama with Min. Farrakhan at a Congressional Black Caucus gathering. In the continued aftermath of the Minister’s Saviours’ Day address, supporters and detractors have taken to social media. Those who see the value in his track record of positive and redemptive support and work in Black communities in the U.S., Caribbean and Africa have shared their thoughts online. “Minister Farrakhan, you are the only black man left with a spinal cord, please keep teaching!” @KellenPhipps said via Twitter. “If you have been positively impacted by the Honorable Min @LouisFarrakhan & the truth he speaks, this is the time to stand & be a witness bearer of the truth. #Farrakhan #iStandwithFarrakhan,” @Tru_Star_ commented. Yonasda Lonewolf Hill, an organizer of many social justice movements around the country, said it touched her when the Minister spoke about the value of the woman during his Saviours’ Day message. Min. Farrakhan addressed the world Feb. 25 at Chicago Wintrust Arena. The message was broadcast live via internet. “Something that was really, really key was the power of the woman,” Ms. Hill said. “And another thing he said was, the new world starts with the woman. And so right now, in this realm, in this time that we’re in right now, how we’re taking leadership positions in revolution, taking leadership positions in politics, of change, so it’s beautiful and I’m motivated, I’m fired up because, you know, this is the time for us to be able to help birth in a new world,” said Ms. Lonewolf Hill, daughter of the late Lakota Sioux activist Wauneta Lonewolf. Tamika Mallory, an activist and organizer of the Women’s March, said she received a jewel from the Minister’s lecture. “I think today what I was able to take home as a real jewel, is where the Minister was talking about really not allowing fear to cripple you and as leaders, how we have to find a way to confront the fears that we have,” Ms. Mallory said. Author, professor, activist and intellectual Dr. Cornel West was also in attendance. “I’m here because I have a deep love for Min. Farrakhan, we go back over 35-40 years and he’s been fearless and he has been bold. Despite whatever disagreements he and I have, we have a deeper love of the people,” said Dr. West. “We need a cacophony of voices that is telling the truth that’s not scared, that’s not afraid, that’s not intimidated. We need a whole coalition of voices and Min. Louis Farrakhan’s voice is one of them,” he added.